Quite a while back I did a review of the first 3x3 Eyes OVA from Toei Animation. It was a solid little series albeit with a few problems. So, how does the second OVA from Studio Junio hold up? Is it as good as the first, better or weaker? Let's take a look, My Dears, and find out. This is 3x3 Eyes Seima Densetsu. Four years after the first OVA, Yakumo is wandering alone in search of the missing Pai. He finds her, but she doesn't seem to remember him and freaks out when he starts chasing after her, treating hi like he's some strange pervert. After speaking with the elderly couple that she's been living with, Yakumo finds out that Pai lost her memories. After fighting a monster that tried to reseal them, he sets out for Tibet to find an old monk who knows how to release the seal on her memories. She goes with him, curious about what secrets her past holds. Let's start with the big problems with the OVA. The ending is a big one. They had a chance to have a really strong, bittersweet ending, but they screw it up at the very end and opt for something that would be better suited for a cheesy children's movie than a more dramatic series for adults. There's also still an issue with the romance elements being pretty weak and, given the amnesia and handling thereof, this OVA doesn't even ultimately do anything to advance the romance. There are plenty of good things about the OVA too. The overall story is actually really interesting with a legitimately good twist. The Hindu influence is still strong in the series and it's still used in an intriguing way. Only a few of the major characters from the first OVA return, Yakumo, Pai, and Benares. We get an all new supporting cast for this one. I will give the series credit, most of the supporting characters are fairly interesting and fleshed out. The exceptions being the old couple who took Pai in and her friends from school who are just generic. Yakumo's character develops pretty well. He's become a lot more capable of things besides just being a human shield. He still has his moments where he takes enough damage that he would die if he was a normal human, but he at least manages to give a good account of himself. On the downside, Pai is actively annoying in this one. When I talked about the first OVA I said that the only thing stopping her from being an annoying character was the Sanjiyan personality. In this series the Sanjiyan has about five minutes of screen time before the very end when she takes over to wrap things up. Studio Junio puts a real effort into replicating the style that Toei Animation used for the first OVA. And it does hold up pretty well. I will give them the proper credit on that account. It is, however, not as strong as the first series. The voice work is still really good. 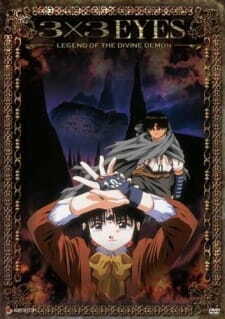 Hayashibara Megumi, Tsujitani Kouji, and Ootsuka Akio all give strong performances as they did in the first OVA. Ohtsuka Houchu, Canna Nobutoshi & Saikachi Ryuuji all give good performances as well. The one weakness is that the bland side characters have kind of weak performances to go along with them. The music is still pretty spectacular with Wada Kaoru returning to work on it. 3x3 Eyes Seima Densetsu is not as good as the first OVA. It has some strong moments and it does advance Yakumo's character but it also has some real writing problems, some weak secondary characters and performances. It's worth watching if you enjoyed the first OVA and it's still pretty decent in spite of those flaws. My final rating is a 6/10. Next week I'll look at Cardcaptor Sakura: The Movie. When come back, please bring Pai. But seriously, the nice thing about this anime is that Yakumo finally comes into his own, having learned how to use his own abilities as a Wu, their roles reverse and he starts to save her rather than the converse. Its bloody and violent, and of course, as Yakumo can't die, he winds up splattered all over the place, but he's lost a little bit of his comic edge having been hardened by his journeys. The story at times seems somewhat fragmented in comparison to the manga. It tries to rise a bit above the generic random anime-monster of the week, and succeeds a bit better than its predecessor. Both the art and sound were good for their time, but the art style is somewhat dark and hasn't aged well. But in the end its all about the endearing quest of one girl to become human and Yakumo's inhuman efforts to help her on her way, and these characters help drive this anime. I don't give it a 10, if only because some of the support characters tend to be a little 2-dimensional. All in all, it is a journey that is well worth your time. I picked up the DVD since after being left on hold from watching the original 3x3 Eyes fansubbed a long long time ago. After a very long wait unfortunately I was pretty darn disappointed to the point I didn't want to re-watch the first OAV. Since the manga was continuing and the OAV's were just there, it leaves yet another cliffhanger to which there is no end. I don't understand why these producers, studios or whoever lets this happen, it's almost a crime. The only redeeming factor is Yakumo actually knowing how to fight for once.